Talk about a vacation! 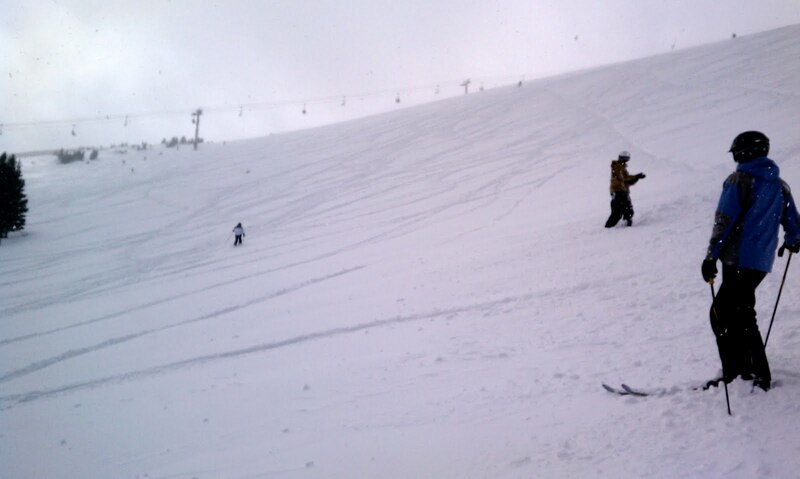 Family, friends, snowboarding, powder...this is why I live in Colorado. For 4 years my sister and an assortment of other family friends have come out to Colorado for some spring skiing. This year we had a huge group, there was my girlfriend Ryann, Mary Kate and Brian Flynn, Christine Eckert, MK's boyfriend Justin and his friend Jeff. With me and my sister that made 8 people on one condo!!! The condo was a good size, but for 8 people and luggage it was definitely cozy. The condo was in Beaver Village Lodge just north of Winter Park, so it was a quick drive every morning to the slopes. 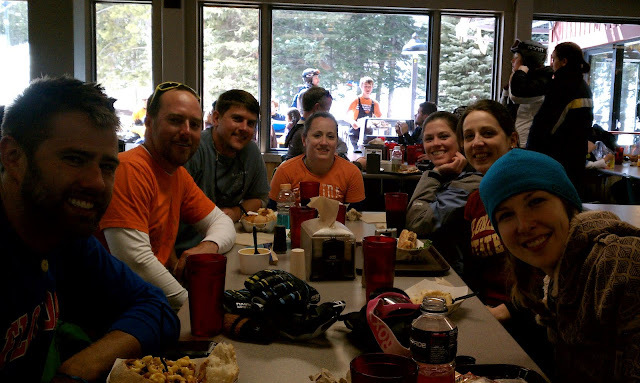 Half of the group got into Colorado, from Florida, Wednesday night and went skiing Thursday. I was at work Thursday, but the plan for me was to leave early to get down to Denver. I needed to pick up a new Burton snowboard and meet my sister and girlfriend at the airport. We would head up to the mountains that night. Thursday afternoon I had a couple stops to make. First it was to Burton's showroom in Denver to pick up a new snowboard and bindings. After riding the Burton Joystick at the SIA On Snow Demo I had to get a setup of my own. I swung by the showroom and picked up the gear with plenty of time to get it waxed at the local Colorado Ski and Golf store. Marianne and Ryann weren't getting into Denver until later that night so I met up with my friends Mike and Crystal and got dinner at the Cherry Cricket. Our friend Austin met up with us as well and he was going to try and meet us for a day at Winter Park as well. Dinner was great and as we were finishing up I got a call from Ryann saying she had arrived. Marianne was delayed for about an hour, but I headed out to DIA to hang out with Ryann until Marianne got in later. Ryann and I got a beer at the airport while waiting for Marianne and eventually we all left DIA for Winter Park. The drive was easy but we got in really late and hit the sack looking forward to the next day. 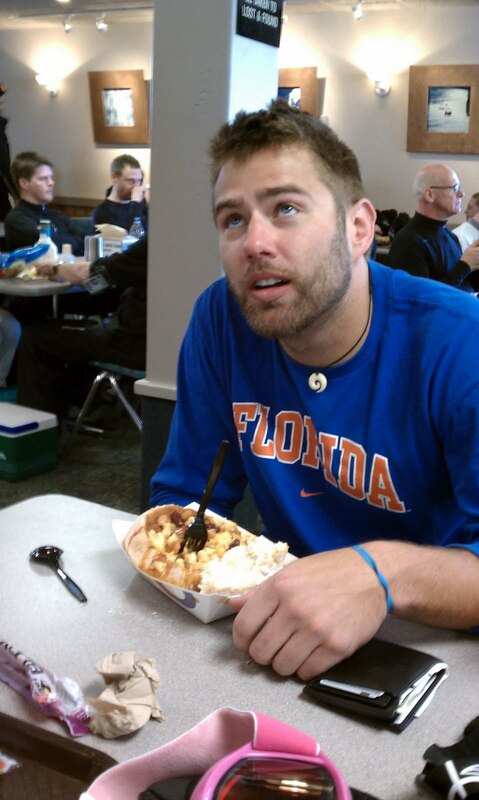 and then more mac n' cheese!!! Check out more after the break! 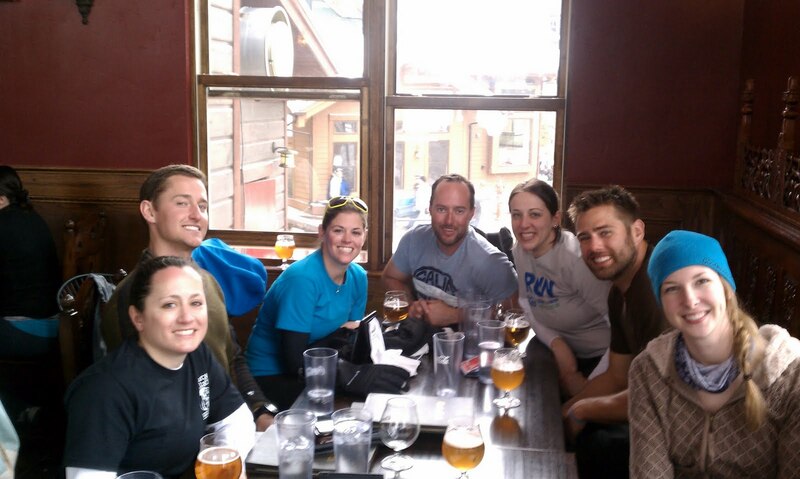 After each day of skiing we would hit up a local bar at the base of Winter Park. For the three days of skiing we hit the Derailer bar twice and checked out the Cheeky Monk as well. 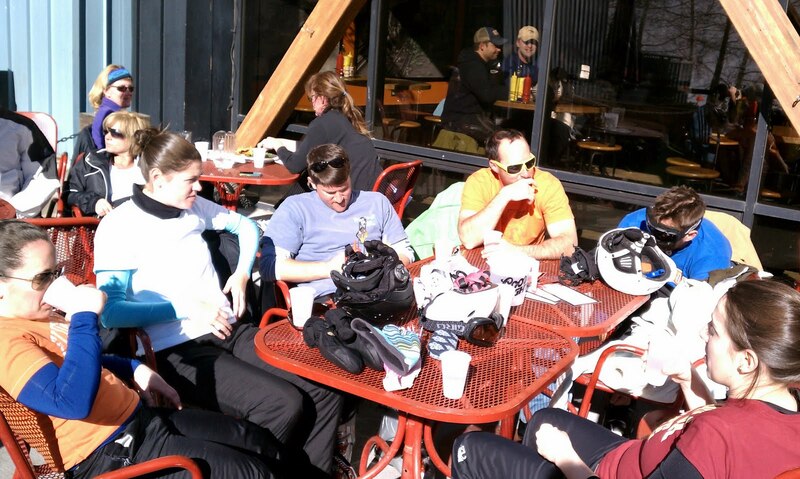 Derailer was great because of the outside seating, so we put a bunch of tables together and got some sun. Pitchers were cheap and a seat at the end of the day was great. We actually met up with two close family friends from Gainesville as well. 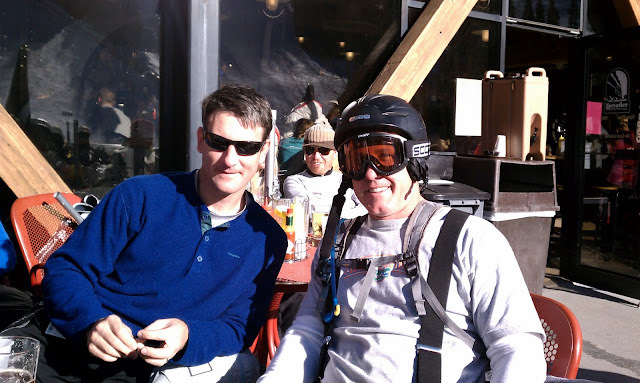 Tim and Tom Weber have always gone skiing and they were out for what Tim called a "surgical strike". At the Cheeky Monk we were looking to watch a little of the NCAA Tourney and meet up with Ryann's family. 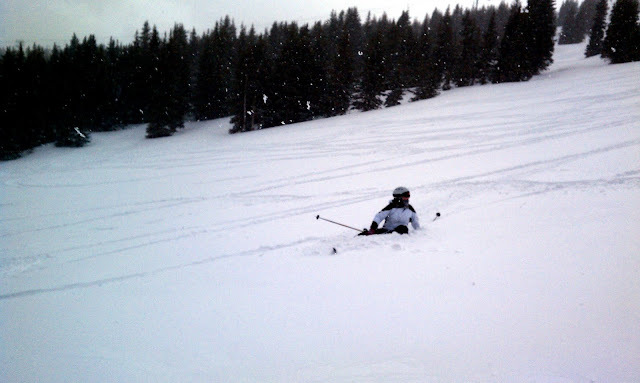 Her parents had driven up that Saturday with her brother so he could get some skiing in with a friend. We did a few runs with them early in the day and finished up with everyone at the Cheeky Monk. While we were skiing with Conlan I actually hit a personal best for top speed on my snowboard. Check it out here...45 mph!!! The crew at the Cheeky Monk, plus Austin! The last day was the best. Saturday night gave us about 9 inches of snow!!! We got up early and loaded the cars in time to hit the slopes before most other people had arrived at Winter Park. Berthod Pass actually got closed, so the resort was ours for the taking in the morning. You could hear ski patrol blasting avalanche terrain and so we hit the frontside of Witner Park to get our legs going. Everyone wanted to get fresh tracks in the powder so we raced over to Parsenn's Bowl just in time for Panoramic Express lift to open. Let's just say the 9 inches they reported felt more like 12+ inches!!! We had a blast. Almost everyone that was visiting had never ridden powder so it was a spectacle. However, after the first run the Flatlander visitor were ripping up the steep terrain. We got Marianne on her first powder as well as Ryann and they both did really well. Marianne enjoying the new snow!!! Overall the vacation was great and everyone had an amazing time. Ryann flew out Sunday night and I headed down to Denver Monday morning with Christine and Marianne to hang out for the day before they left. We hung out downtown, got a snack and then I dropped them off at the airport. I can't wait for next year...return to Steamboat where it all started, who knows?!?! I have a ton of video from my point and shoot camera as well as my Contour Helmet Camera. Look for videos to pop up soon. I was looking for blogs about Beaver Village to share on our site and I came across your post...If you're open to it, shoot me an email at jane(at)dwellable(dot)com.